What does the Bible say Heaven will be like? Do animals go to Heaven? Is Heaven a real place? What must I do to go to Heaven? These are all question we can find answers to by looking in the Bible. Other questions like, “Is there really a being called Satan?” and “What does the Bible say Hell will be like?” are just two of the many questions about Hell that we will look at in this eBook. Throw away your preconceived notions about Hell as you read what we share with you here! The End Times events frighten many people and so they simply never take the time to learn about these things. In this section you can read about that number “666”; events that lead up to the end of this world and even the rapture of the Church. You can download your copy today. 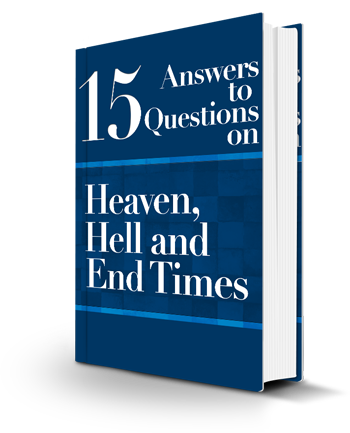 Simply enter your name and email in the form at the top of this page and we’ll send you a copy of the book 15 Answers to Questions on Heaven, Hell and End Times today!